The latest edition of Drag'n'Drop was released at The Wakefield show and is now available directly or via the Plingstore. Drag'n'Drop is the long running online magazine, released as a PDF document which you can read on your computer or printout. As a PDF, the magazine can contain clickable links, taking you straight to downloads and websites. The news section is right up to date with the Wakefield Show. 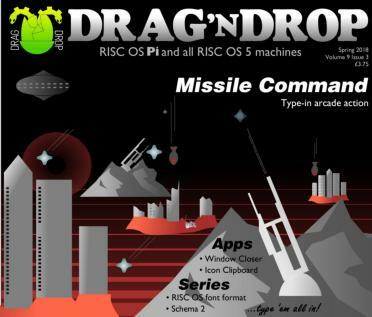 The cover includes a picture of the classic Missile Command game, and there is a BASIC listing for the game. You can purchase all the code listing with the magazine to save typing. There is a nice explanation of how the code works. There is a new series starting in this edition on using Schema2, complete with links to download the free version. Drag'n'Drop does many multi-edition series and back issues are available if you find yourself joining one mid-series. The series on how RISC OS fonts work moves to part 2. We dissect Outline files and peek inside with a small BASIC program. Paul Stewart (original founder of the magazine), makes a welcome return with a review of RaspberryRo Lite 3 from Fourth Dimension. He also has a second hardware review on the Vonets VP11G Wifi router. Great to have you back, Paul. This months little utility to make the RISC OS experience even better is a WindowCloser utility. With one single application on your task bar you can list and close all open windows. A simple Icon Clipboard utility also allows you to copy and paste text between writable icons. Finally, you can read reviews on the latest release of ArtWorks (is it worth the money for the new tool) and Philips Music Scribe (now available as a free download to Plingstore). Something for everyone in this edition and an enjoyable and entertaining read with lots of practical projects. The Magazine is available from the website and you can also buy a version with the code listings.